The Russian Embassy in Libya, which is temporarily based in Tunisia, initiated investigation for the circumstances for the detaining of the cargo ship Merle in Libyan territorial waters off Tripoli. The official representative of the Ministry of Foreign Affairs of the Russian Federation expressed the hope that the relevant companies will draw appropriate conclusions and will resolve the problem with the several Russian sailors. The authorities promised to take all the necessary steps in newly emerged crisis situation. The Ministry of Foreign Affairs of the Russian Federation was in contact with the Libyan coast guard and were ensured that the sailors will be treated according to the local laws and will have fair trial. “According to incoming information, on March 5, the coast guard detained the Russian freighter Merlo in the coastal waters of Libya and arrested her. At the time on board there were seven people, all of them are Russian citizens”, said the Director of the Information and Press Department of the Russian Foreign Ministry, Maria Zakharova. “Of course, all possible steps will be taken to settle the newly emerged crisis situation with our citizens in Libya as soon as possible”, added she. In connection with the continuing military and political situation in Libya and the threats to security of the Russian citizens and organizations with business in the country, the Foreign Ministry remind to refrain from visiting Libya for reasons of security until the situation in the country is normalized. 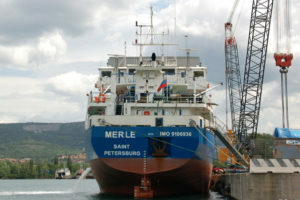 The Russian freighter Merle was arrested by Libyan Coast Guard militants off Tripoli. According to the local authorities the crew didn’t have necessary entry permission from Libyan authorities. The coast guard arrested the vessel and escorted her to Tripoli where was anchored until further investigation.